Feed your inner child with these awesome, fun-to-eat chicken fingers! In a large bowl, whisk flour, baking powder, salt and paprika until combined. Add water and eggs. Mix until it forms a batter. Dredge chicken fingers in the batter. 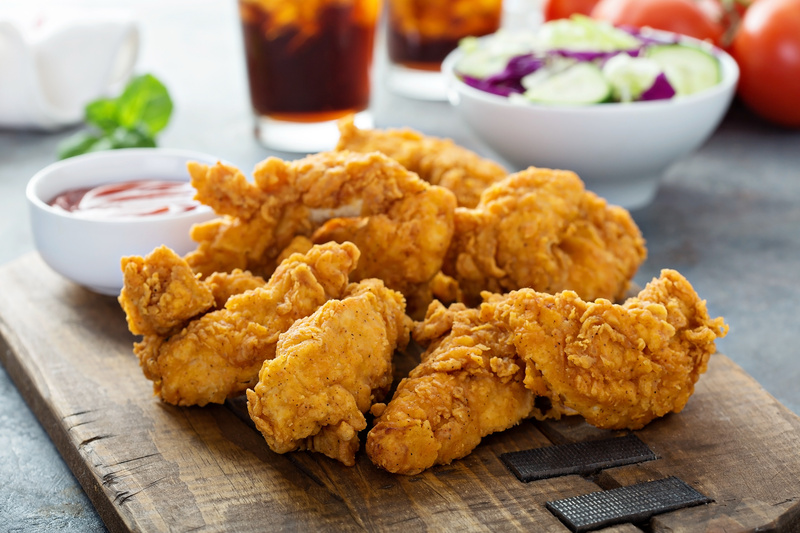 In a medium-large pot, heat two inches of oil to 350 F.
Fry chicken fingers until golden-brown on both sides, for no more than 5 minutes total. Depending upon the size of your pot, you may need to do this in several batches. Drain chicken fingers on a paper towel-lined plate. In a small saucepan, bring all dipping sauce ingredients except for cornstarch mixture to a simmer, stirring constantly until smooth. Add cornstarch mixture and stir until sauce thickens slightly. Serve chicken fingers immediately, alongside dipping sauce.